Sign up for Broadjam today to follow Tracey James Marino, and be notified when they upload new stuff or update their news! Unique classical guitar Christmas album featuring SATB four-part arrangements of all-time favorite traditional carols. 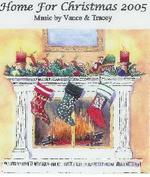 All songs arranged, adapted, and performed by Vance Marino. Produced by Vance Marino & Tracey James Marino, SongMaker Productions. Watercolor art by Artist Richard L. Weddleton. SONG LIST: Angels We Have Heard On High, Away In A Manger, Carol Of The Bells, Coventry Carol, First Noel, Go Tell It On The Mountain, God Rest Ye Merry Gentlemen, Hark! The Herald Angels Sing, Joy To The World, It Came Upon A Midnight Clear, Lo, How A Rose E'er Blooming, O Come, All Ye Faithful, O Holy Night, O Little Town Of Bethlehem, Silent Night, We Three Kings, What Child Is This?, and What Star Is This?